Our advanced formulations can also extend the life of the machine. Ink that separates not only results in poor image quality, but the water from this separation can cause corrossion in the cylinder. 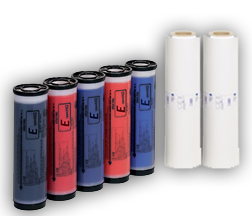 RISO masters are formulated to work perfectly with the master loading and disposal systems, as well as the thermal head that produces the image. RISO supplies ensure great, clear copy, and no worry about the possibility of damage to machine parts that can result from using non-RISO inks and masters.